Mr. Griffin is the least-liked teacher at Del Norte High School. It's not just because he is the toughest grader in the school, or won't accept late work for any reason. He even fails seniors and makes them beg to get back in his class . the next year. This time, he's humiliated the wrong students. When a group of classmates decide to kidnap him, the plan is only to scare their English teacher-to make him grovel and give him a taste of his own medicine. They don't intend to kill Mr. Griffin. But sometimes plans go horribly wrong. Hair-raising suspense percolates through this remarkable audiobook. 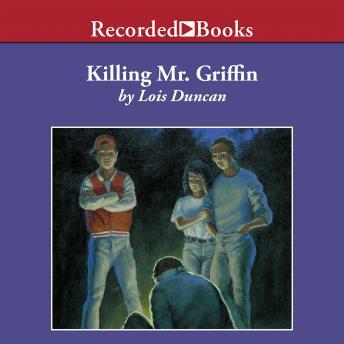 Best-selling author for young adults Lois Duncan has earned awards from the Mystery Writers' Association of America and is a recipient of the Margaret A. Edwards Award, sponsored by the School Library Journal and the ALA Young Adult Library Services Association. Ed Sala's narration sizzles with the intensity of life-and-death decisions and their chilling aftermath. Great book, had a good plot. The narrator was excellent!